President Goodluck Jonathan has congratulated the Golden Eaglets on their 6-1 white-washing of the defending champion, Mexico in the on-going FIFA Under-17 World Cup taking place in the United Arab Emirates. The president equally urged the Eaglets to remember that they have just overcome their first opponents in a long tournament and must therefore stay focused on winning their subsequent matches, getting to the finals and claiming the championship once again for their fatherland. This is contained in a statement issued Sunday in Abuja by the Special Adviser to the president on Media and Publicity, Dr. Reuben Abati. Jonathan called on the Nigerian Under-17 team to avoid all possible distractions and continue to display the exhilarating soccer skills, commitment and dedication which overwhelmed the Mexican team Saturday, in all of their subsequent matches. The president assured the Eaglets and their handlers of the steadfast support and encouragement of the federal government, adding that he was looking forward to another victory when they take on the Swedish youth team tomorrow. 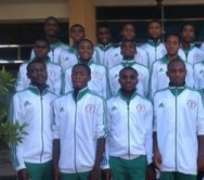 Also yesterday, the Senate President, David Mark, commended the Golden Eaglets for defeating the Mexican 6-1. In a congratulatory message released by his Chief Press Secretary, Paul Mumeh, Mark noted that with such an outstanding performance, Nigeria was gradually stamping its authority on the international soccer arena. It urged the Eaglets and their officials to remain focused, maintain team spirit and determination to emerge the winners of the championship. The statement assured them that Nigerians were praying for their success, saying that government recognised the importance of the championship and would do its part in terms of adequate welfare for them. The senate president noted that sports generally were now potential tool for international politics and an ingredient for achieving national unity and cohesion. He also commended Aminu Maigari and the board of the Nigeria Football Association for good organisation so far. National Telecoms Operator and major sponsor of Nigerian national teams, Globacom, congratulated the Golden Eaglets on their opening Group F match victory. Globabom in a press statement yesterday‎ commended the team for the outstanding performance against the Mexicans and urged them not to rest on their oars. 'It did not come to us as a surprise that the Golden Eaglets started brilliantly because we were convinced that the team's preparation was wholesome,' Globacom stated. 'Therefore, we heartily commend the players for living up to expectation and enjoin them to concentrate fully as the competition is still a long way off.' the statement added‎. 'We also commend the coaching crew for stringing the winning formula with which Nigeria demolished the Mexicans to put the country on course to win the U-17 World Cup trophy for a record fourth time,' ‎Globacom stated further.